This was a very quick and easy card, made using the Modern Essentials Cut, Foil and Emboss dies. 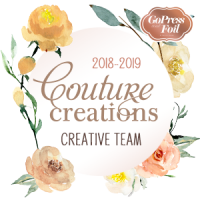 I began by adding a piece of Le Petit Jardin design paper to my cardbase. Next I used the beautiful Cut, Foil and Emboss Modern Essentials Decorative Nesting Lacy Frames with purple foil. I also cut out a circle to go over the top when I discovered my greeting was slightly too large to do what I’d planned. 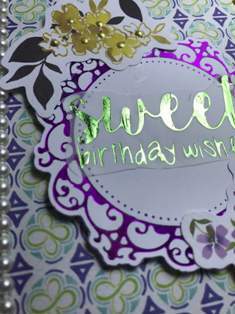 So I foiled the greeting – Sweet Birthday Wishes – onto vellum then added it to the circle die, and using foam tape, added that to the Modern Essentials base. 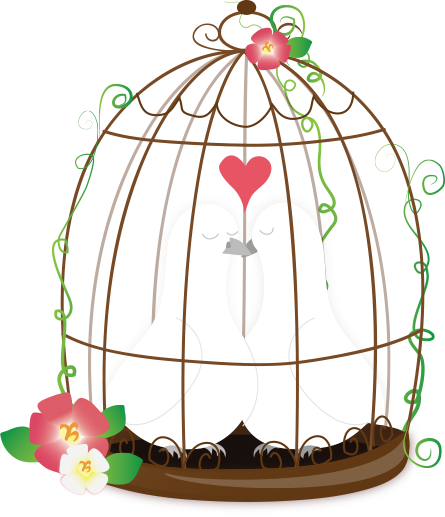 Next I took some pieces from the Le Petit Jardin Ephemery pack, and added them to the top and bottom of the card. 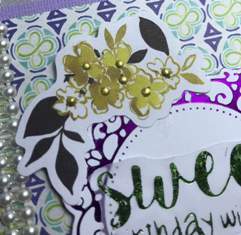 Lastly I added that beautiful pearl strip you can see on the left hand side of the card. I added a few gold Nuvo drops to the top and bottom right hand corners, and also to the flowers to the top Ephemera. Above you can see the finished card. 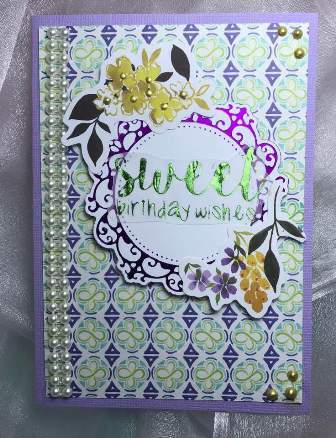 Very simple to make, but a very pretty card. This is so beautiful and I love the foiled look to it.